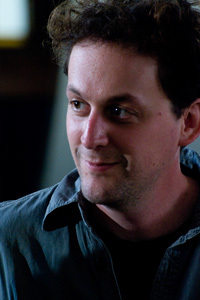 Hammer To Nail: My most striking memory of your first feature, The Guatemalan Handshake—aside from like the most perfect screening ever at the Maryland Film Festival—was sitting in an East Village bar waiting for you to show up one day and I looked out the window and there you were lumbering down the street carrying your one-and-only 35mm print of your film! 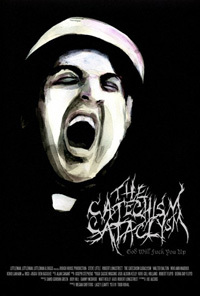 In many ways, The Catechism Cataclysm was a much more contained production. But it also came together freakishly quickly. How did it officially happen? H2N: I’m sure he was nicer about it. TR: He was really nice about it. [both laugh] I was debating how to do it. I was gonna shoot in Austin, I was gonna shoot in upstate New York, and then Longstreet came and said, “I’ll give you some money to get it started,” and I sat down and decided, “Maybe I should just do this for cheap,” and within a half hour I called him back and said, “Yes,” and then he called David [Gordon] Green and he agreed to put a little bit more money in. Basically, the money started coming together really fast, and before I knew it, we were off in Seattle doing it. We couldn’t shoot in upstate New York. Nobody would help us. Nobody would help us in Austin. Nobody would help us in Virginia. H2N: Your initial plan was Austin, right? TR: It was but then nobody could work on the crew. Everybody was like, “Well, I could do like a day.” And then Megan, my friend Megan Griffiths, who was producing it, said she had all these crew people and it would be too expensive to fly ‘em down, and I was like, “Well then we should just shoot in Seattle.” ‘Cause their rivers aren’t as dirty and stuff. And then, after that decision, it was just a matter of a week or something and I was in Seattle and we were putting it together. And that was the case, like every phone call that came was a good phone call. It was always good news, somebody wanting to help. And then we did that Kickstarter campaign, which I was super hesitant to do, to announce that we were shooting anything. TR: Well, all of my ideas were like, “Let’s not have anything that we have to send or buy.” So our prizes were prank phone calls, and then people really wanted us to do actual prank calls, like call their boss who they hated. It wasn’t a fun thing for people, we were being set up to do revenge calls, ex-girlfriends and stuff, so we started doing the movie and then we just never did the Kickstarter prizes. H2N: I remember seeing your campaign and thought of course you would have those really creative ideas, but that’s funny that it turned into people wanting to maliciously punk people from their past. H2N: So Megan led you to Seattle. Your prior relationship with Longstreet led you to him. What led you together with Steve Little? TR: He did a reading for us for this new movie, Scoutmasters, for the Sundance labs. I met him there and he was just up for doing something. People weren’t throwing starring roles at him. So I wrote to him and asked if he was up for it and thankfully he was. He came on without knowing anybody. He was the one person who didn’t know who any of us were or what was going on. But we had mutual friends, like Kent Osborne, who worked with him on that Flapjack show that they did [The Marvelous Misadventures of Flapjack]. He came up to Seattle blindly. H2N: And did he show up like a day before or a week before? TR: We only shot 12 days, so he showed up the day before. He and Longstreet flew in from LA. TR: Yeah, they got haircuts together. [both laugh] They hadn’t met. We died Longstreet’s hair black and he had this beard and we died that black and it was disgusting. It was this big pubic patch right on his face. [H2N laughs] I came in and I saw him and I was like, “Oh God,” and already thought the whole thing was destroyed. But he just shaved it off and it worked. So the two of them met up and we just jumped into it. We shot that diner scene the next day. We did not know what we were doing and fumbled our way through it, and then eventually found it. I think there’s that moment where the actors either get on board or just decide that they hate you. I remember seeing Steve decide he was on board. 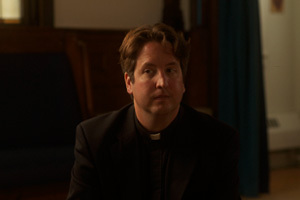 H2N: So if that scene was the first day, did you shoot in sequence—aside from the isolated priest-in-church bookends and stories-within-the-story sequences, that is? Or were you all over the place? TR: We were a little bit all over because we had to do stuff in Seattle, and then we went out for the second half out in the country, out in the middle of Washington state. So we had to divide that stuff up and weren’t able to shoot in sequence. But I wanted to shoot that diner scene first, ‘cause that was where they really got to know each other. If there’s gonna be something awkward, it should be that. H2N: And was that the same day you did the toilet scene too? TR: No. That toilet is in a rodeo. [H2N laughs] It’s so weird. We were walking through this amazing location where they have these big rodeos in central Washington. They took us through this whole back area with all these horses and cows and bulls were, and we’re like, “No, we’re just here to use your bathroom.” [both laugh] It was the only bathroom stall we could get. It’s like going to the Taj Mahal and then shooting in their toilet. H2N: Knowing that the diner scene was so important, did you schedule it so that you’d have more time than the other footage you had to blow through? TR: I mean, like anything, the plan was to have more than enough time, and then when it came down to it we didn’t. It was just one of those things where we had to run and push to get it, and Steve and Rob were still trying to figure out who they were. There was no time. That’s where all that awkwardness was. It would have benefited from a rehearsal. We would have saved half our day if we’d had that, but we didn’t, and so that’s where that time went. H2N: In a day-to-next-day sense, what type of preparation was there? TR: Once we moved to central Washington and we all lived in these houses together. At night, Alan [Canant, editor] would be cutting, and we could look at older stuff that we’d already shot. I mean, it was a deal. We’d sit around a fireplace, Longstreet would buy everybody bottles of wine. They would run lines together, and I would chime in a little bit, or they might have some questions, but I would just try to stay out of their way. So we had that time to plan, which was great. At least it felt a little more laid back; it didn’t feel like work. You could go take a break. That’s the way to do it, I think, where everybody’s living together. I think that’s such a huge thing. If you can get that commitment from people to live together. It’s like a vacation, and if you shoot in a good location, that’s the way to do it. H2N: And on your budgetary scale, was that where a lot of the money went, simply scoring the house or houses to put everybody up? TR: Yeah. A big part of our budget was that, just housing, which wasn’t really that much. We just kept everything super cheap. That was a necessity, to be out in the country. H2N: We should probably keep this relegated to Catechism and not get into this new movie of yours just yet, which is on a dramatically larger scale. For me, shooting an under-100k movie took the pressure off in a really great way, which enabled us to take chances and not have to filter dozens of opinions. I mean, it’s always high stakes and stressful, but did you feel a sense of freedom with this production in a way that you hadn’t/haven’t before? TR: For sure. The stress with Catechism was risk, like is this going to work as a movie? The stress wasn’t if it was the right thing to do or not. We just didn’t have to go through that process. We were finding our way together and I feel like the stress was more about how we were making something that we weren’t even sure if it was gonna work, and that felt like a good kind of stress. We may completely fail but in the right way, you know? It felt like if this was gonna be a failure, it was gonna be a noble failure. It wasn’t gonna be that we had planned everything out, we had accounted for everything, and perfected every detail, and then gone out and realized that it didn’t work. Maybe I’m not explaining that right. H2N: No, that makes sense. TR: The risk factor was invigorating. It was what made the shoot so fun. Right before we shot that argument scene with Steve and Rob, I turned to Megan and said, “We’re screwed, this is gonna be terrible,” just because we didn’t have enough time to do it. And then all of a sudden it just happened and it worked. I think if we had planned it out to the T, it wouldn’t have worked. But that was the commitment of those guys. Everybody was there for the right reason, ya know? I think if somebody else had been there for the paycheck, and gotten the sense that the operation was shoddy, they would’ve given up. But these people were dedicated to making it right. Every crew person was. That’s what we were there for, and that went a lot further for the film. ‘Cause if you’re feeling like it’s failing everybody’s jumping in to save it and not saying, “Well, I get paid regardless.” Everybody has to be making the best film that they can. That’s what I’m trying to say. Everybody could feel that sense of risk. That kind of stress is a good kind of stress.